I had always wanted to have a "Lavender Farm by Bodega Bay". Why Bodega Bay? It's a beautiful place on California's North Coast where I often went to retreat and write my books. Somewhere in my fantasy, I envisioned a lavender and herb farm in this wonderful wild and craggy coast. Except it's cold and windy, as is the nature of the coast in northern California. One day while searching for property I found the perfect site for my lavender farm. 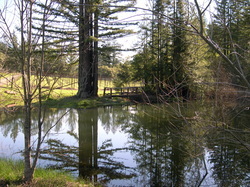 A beautiful parcel with a pond, old growth redwoods, a home, outbuildings, an ATV and a tractor! I fell in love with it the minute I visited it. It was my Lavender Farm by Bodega Bay! And I knew I had to fulfill my fantasy. Oh, did I mention there were grapes? a little 3 acre vineyard. But the realtors were great salespeople. (and I was in love with the place), They said, "Oh Lynn, don't worry. You're a gardener. If you can grow roses, you can grow grapes. They're in the same family". And so I bought the place to plant my lavender and herbs. I ringed the perimeter of the vineyard with lavender and eventually planted more than two acres of lavender. And for what it's worth, growing premium pinot noir grapes has no connection whatsoever to growing roses. Talk about gullible! The street name for this place is Lynn's Lavender at Tanuda Ridge Vineyard. And I have to be honest, the vineyard consumed an awful lot of time in the beginning. It still does. But Mike and I got married two years after I bought the place, and he loves the vineyard--and the pond. So he gets to work the vineyard (and it is work!) while I expand gardens all over the property. Lest you think we make wine, we don't. We're winegrowers. We sell our grapes to Furthermore Wines If you want to enjoy their premium wines, visit their website www.furthermorepinotnoir.com. I have to confess. I tend to get a great idea without a plan to accompany it. I just knew I wanted a lavender farm--that was 14 years ago. Well, do you know how much lavender 2+ acres of lavender plants can produce? It's a lot more than the lavender garden at my home on the San Francisco peninsula. The first year harvest wasn't too overwhelming, the plants were still little. But it foretold what was to come. Fortunately, a good friend, Jeff Rebeschung who owns Fine Tree Care, saw my potential plight. He was creating a building site on a property that had an old (really old) cabin on it. The owner wanted the cabin demolished. Well, Jeff knows that I rescue everything. So he asked me if I wanted the beautiful old redwood that had been the cabin. Did I!!!! Jeff's crew salvaged the wood and the cabin and brought it over to the farm. (Several trucks worth). 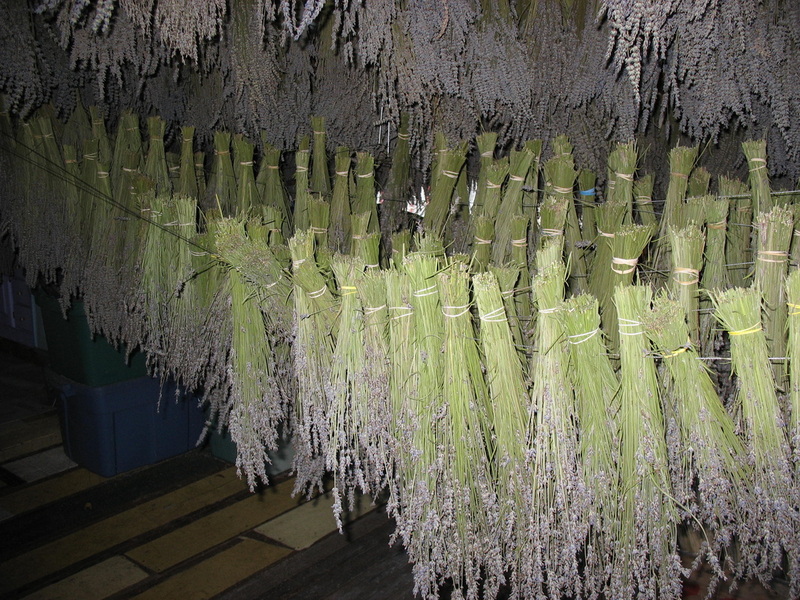 And Cliff Haines, the handyman, built an enchanted drying shed for the lavender. 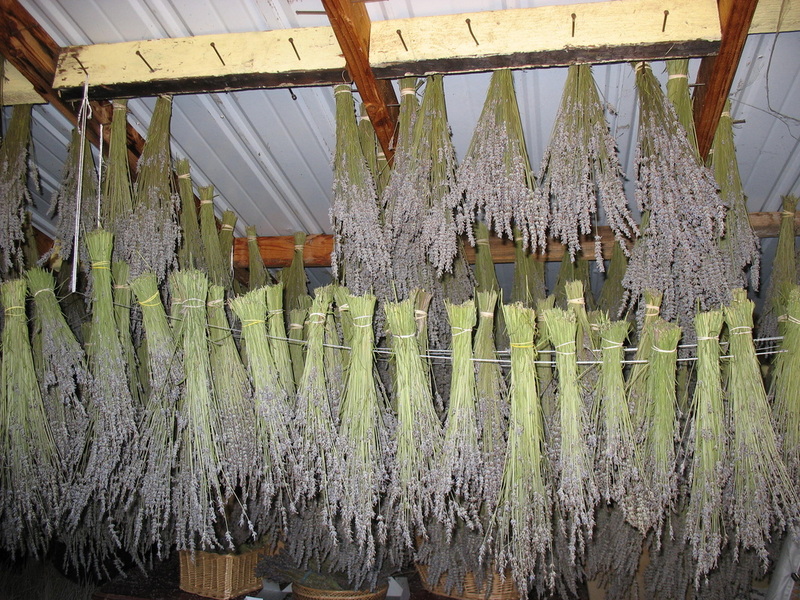 It's an amazing sensation to enter the shed when all the lavender is hanging from the pegs after harve﻿﻿st. The scent is overwhelming. Takes your breath away. And the little lavender buds drop like rain onto your head. Can you find the bee?